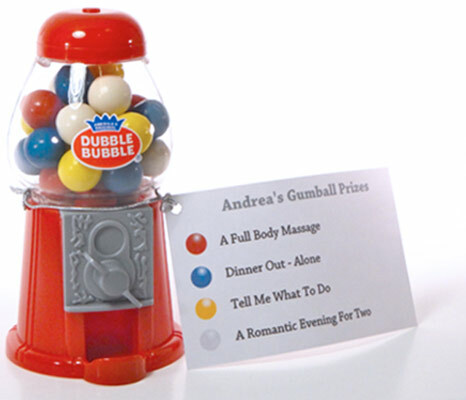 Your partner receives personal romantic prizes from a love gumball machine based on the color of the gumball that randomly falls. 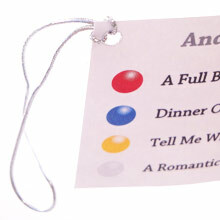 A personalized gumball color chart determines the prize s/he can win from you. This creative romantic idea is similar to a repeated love coupon. Only place a romantic action on the prize color chart that you are willing to repeat since there are mutiple gumballs of the same color. Another option is to remove all of a specific color gumball except one. That one color is the grand prize and creates anticipation. 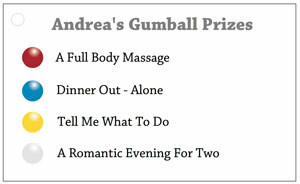 The prizes can range from giving up control of the remote for one night to something a little more intimate and personal. You know your beloved better than anyone. What is it that s/he really enjoys on a regular basis? Write a loving message on the back of the prize chart. Simple instructions to fill in the color prize chart PDF form and where to get an inexpensive mini gumball machine are below. 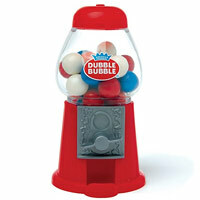 A small 5 inch plastic mini gumball machine with turning handle. Multi-colored gumballs are included. 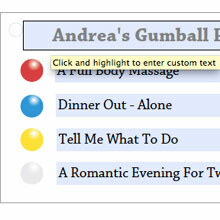 Click and highlight the wording in the PDF form fields to personalize text with your own prizes. 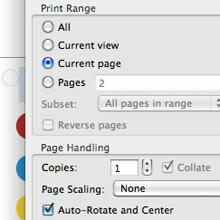 In Adobe Reader, select File, Print (click the button for current page to print page 2 only) and make sure Page Scaling is set to NONE. Screw off the top and poke a hole in the plastic bag. Shake the gumballs into a bowl. Remove the bag and place the gumballs back into the machine. 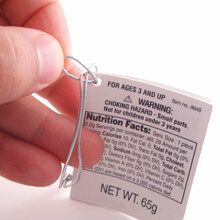 Pull off the tag and pull on the loop of the elastic band to loosen and untie as shown. Thread the tip of the elastic band through the hole of the Prize Chart. Insert the elastic band tip back through the loop as shown. Pull the tip until the elastic band loop ties to the Prize Chart securely. Place the elastic band over the top or use a ribbon to tie the Prize Chart.